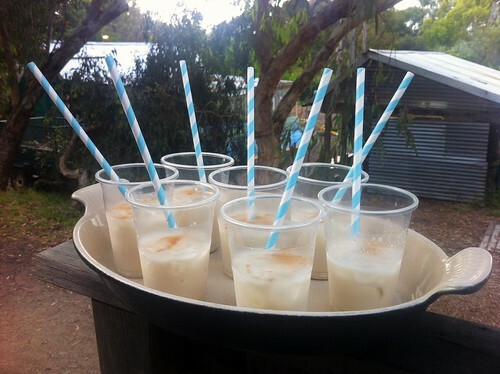 As we all wind down for the year, I thought I'd share some recent food and drink highlights. 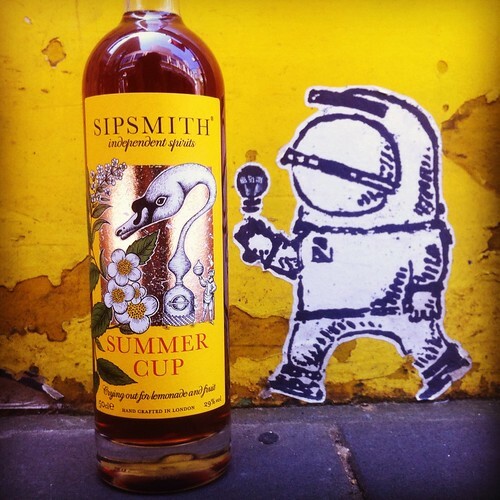 My #1 drink for the summer is Summer Cup by Sipsmith. Over the last year I've been an avid fan of the clean, elegant London Dry Gin put out by Sipsmith, the micro-distillery that was granted its distilling licence in 2009 (the first distillery granted a licence in London since Beefeater got theirs in 1853, and one of only four distilleries currently opering within London's city limits). The new product, the Summer Cup, is Sipsmith's answer to Pimm's: a concoction of gin, orange curaçao, sweet vermouth, Angostura bitters, maraschino cherry liqueur, lemon verbena distillate, Earl Grey tea, cardamom and cucumber. It is *delicious*. Mix it with fresh fruit and three parts good quality lemonade or ginger ale, or add it to Champagne to make a Summer Royale, or sub it in for vermouth in a Negroni, or just sip it over ice. Note: I was invited to an industry tasting, and this bottle was a freebie, but I've already bought myself an additional bottle cos it's so damn good. Sipsmith spirits are imported by Hippocampus in Australia and if you want to get your mitts on a retail bottle in Melbourne, visit King & Godfree or order online from Nick's. We may all lament the closure of Nic Poelaert's Embrasse in Carlton, but the good news is that Nic has teamed up with Gerald and Mario from Gerald's Bar to bring us Brooks of Melbourne, in the slick city basement (formerly the old MoMo, then Fifteen, then The Kitchen Cat) underneath the Hermes boutique on Collins Street. 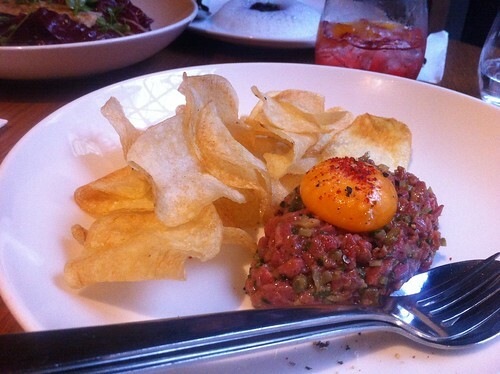 The space is warm, the service gets that balance between old-school professional and personable warmth just right, and Nic's food gets a chance to shine. 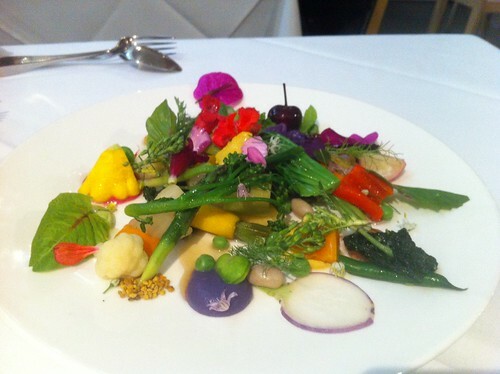 Some of the menu items are more snacky and informal than his previous offerings, like the 'cheeky bun' (I opted for the vegetarian version over the meat burger, and loved it), but some of the favourites from Embrasse have survived the move, including the exquisite méli-mélo of 25 vegetables (Nic's souvenir of his time at Michel Bras' eponymous restaurant in Laguiole, France), the cheesy potato mash aligot and the 'forest floor' dessert. 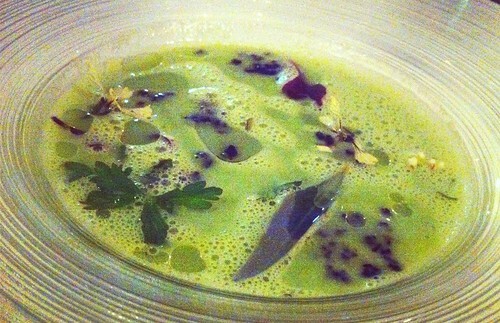 Of the newer dishes I've tried, the broad bean soup with black olive and olive oil is superb. Afraid I haven't listed prices because I couldn't track them down online, but know that their five couse chef's menu is excellent value at $80 a head - get on it, people. As much as I've enjoyed the restaurant menu at Pei Modern (the entree of Dutch cream potatoes, bone marrow, coffee and mojama and the dessert of caramelised tomato stuffed with 12 spices are must-order items, in my book), I keep coming back to the smart bar menu. Highlights on the Pei bar menu include the O'Connor steak tartare ($18.50) and the Ortiz anchovy shortbread with Parmesan custard ($4.50 each). 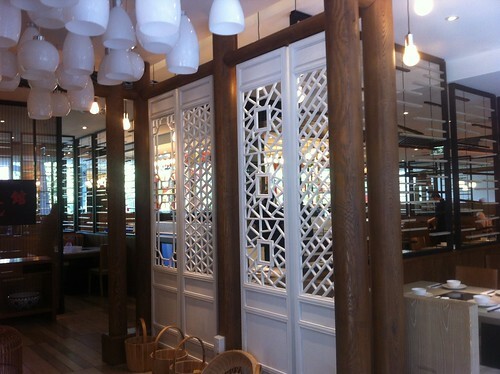 David's, the Shanghai mainstay of Melbourne's southside, has had a stunning refurb after 15 years in Prahran. 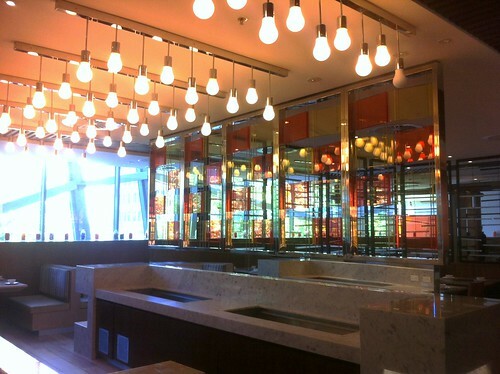 Rebadged as David’s Country Shanghai, the restaurant's interior has been transformed into an airy, sunlit space and its menu has been revamped to include some contemporary as well as traditional dishes, skewed to the more casual end of the dining spectrum. My picks are the steamed bao (two for $10 and a selection to choose from) and the Gong Bo chicken pictured below ($19), stir-fried with radish, cucumber, chilli, garlic and a whole lotta Sichuan peppercorns. After years of listening to Sydneysiders waxing rhapsodic about how great the roti was at Sydney's Mamak restaurants, Melbourne got a Mamak of its own on Lonsdale Street. 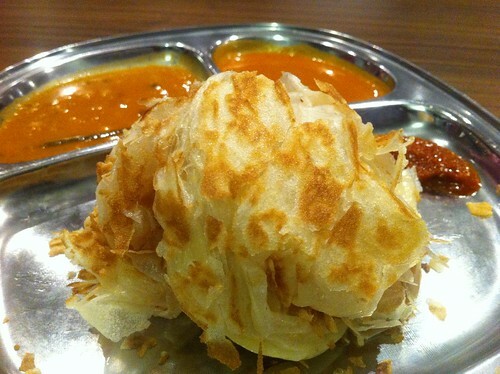 The roti canai ($5.50) really is very good - fluffy and crispy without being oily, and with just enough chew. 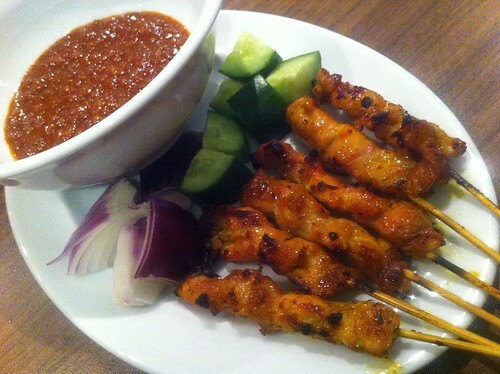 While I was underwhelmed by the kari ikan (fish curry), I rated the chicken satay sticks ($9). And if you want to double down on the roti, make sure you also order the sweet version filled with kaya (pandan and coconut). This was the second year I attended the Christmas Cookoff held annually by 310Fitzroy and some other lovely friends of mine. 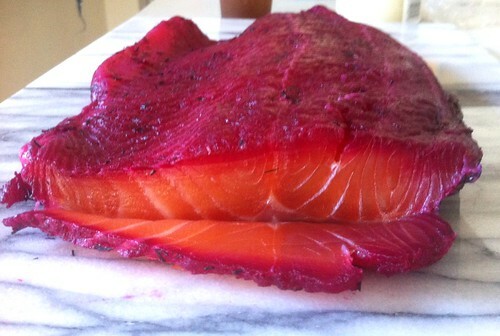 My entries this year: Beetroot Gravlax (adapting an excellent recipe in issue 16 of the SBS Feast Magazine) and the Iced Horchata recipe recently featured on Trotski & Ash. I was equally pleased by how both recipes turned out! 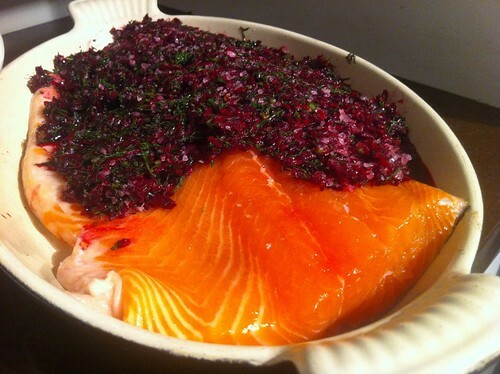 - Sad to read on George Biron's blog that he and his wife are putting their restaurant Sunnybrae on the market in 2013. Hoping that some brilliant chef looking for a change snaps up the opportunity: it's one helluva setup they've got down there at Birregurra (I wrote glowing words about my visit here). - An inspiring post on Talor Browne's blog about how her quest for excellence in specialty coffee, dating from when St Ali was sold in 2006, has taken her from Melbourne to Paris to Oslo. 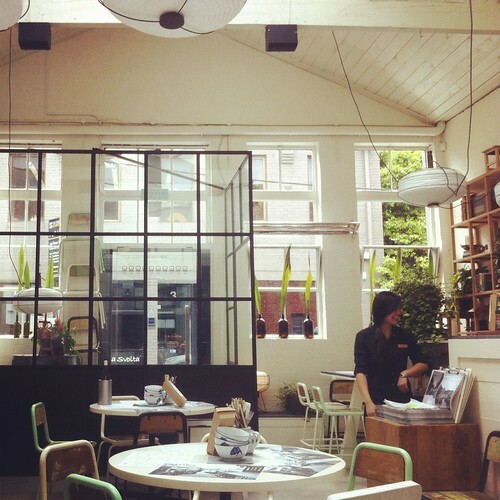 - The Melbourne Coffee Review has a bit of a rant about the Melbourne specialty coffee scene and rival coffee publications/apps. - Ms Stickifingers wrote an excellent primer post on social media for food and beverage businesses on her blog Deep Dish Dreams. Essential reading for anyone in the hospo industry who doesn't understand how social media works. - "The notion of 'sustainable seafood' is arguably the most misunderstood, misguided, poorly managed and hypocritical debate in food." A contentious article by John Susman in this month's foodService. - Cocktail enthusiasts should check out Only Bitters, a new Australian online store that retails over 100 varieties of cocktail bitters and will soon also sell commercial batches of 'perfect' cocktail cherries that the Melbourne owners of the site have made themselves. 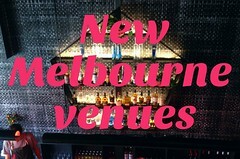 - Reviews of Melbourne's best pubs can be found on the PubStars website. - I've been enjoying reading Alex's writing on tsp. (The Sad Pig), whether it's lamenting the lost days of good menu writing or slipping in a reference to Paul Simon lyrics in a macaroon vs macaron treatise. 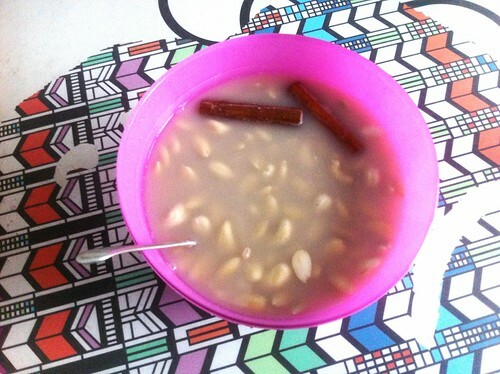 - On the Anatomy of Thrift: Pork Provendor in the Home Kitchen video posts. How to love pigs, and living. - A jukeboxed American-style diner in a decommissioned Melbourne train carriage in Cabramatta? Grab Your Fork dishes the dirt. CHRISTMAS CAME A WEEK EARLY. 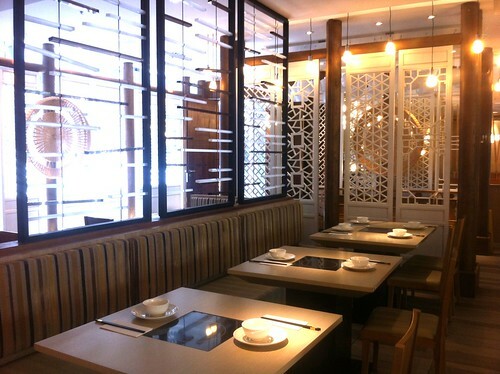 I can think of no better reason to end my blogging sabbatical than the news that the new Dainty Sichuan restaurant has finally opened its doors in Chinatown, in the top floor of the shiny arcade that also houses Dragon Boat. I've written before about my deep and abiding love for Dainty's South Yarra restaurant, which opened in 2009 after years in their earlier Corrs Lane location. 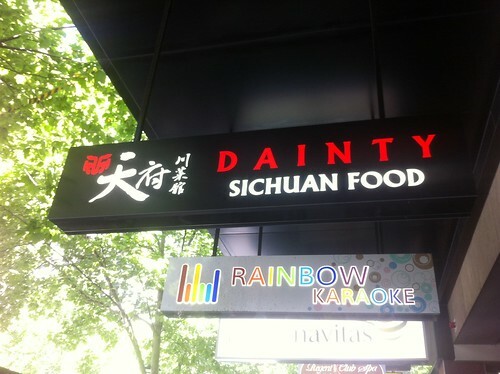 Now they're back in the city with Dainty 2: Electric Boogaloo (uh, actually it's called Dainty Sichuan Food), and I was delighted to scamper down the hill today to check it out on opening day. 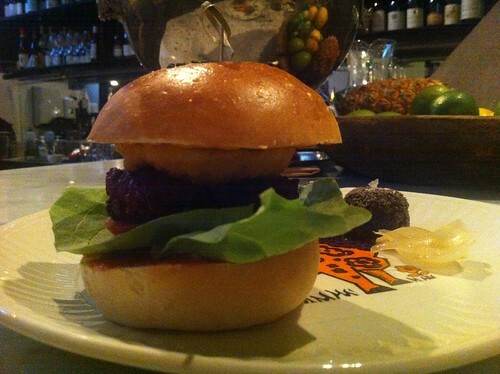 It's Dainty, but not as we know it. While the South Yarra fitout was a definite step up from the scruffy interior at Corrs Lane, DSF takes it up several more steps with a gleaming and polished top-floor 54-table fitout, more akin to Din Tai Fung, Crystal Jade or one of the other posh restaurant chains you see in Hong Kong's upmarket shopping centres. The chefs all hail from Sichuan province and have been working in the South Yarra kitchen, developing some new dishes to bring to town. 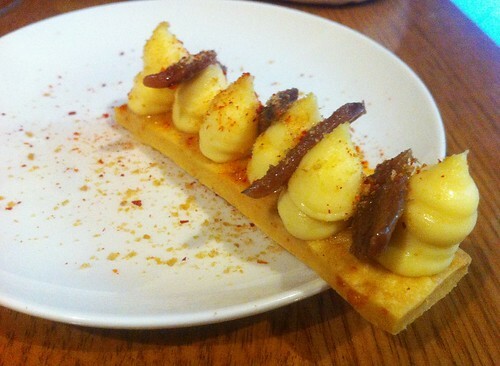 The menu on opening day is a first draft, testing out a combination of old and new dishes. 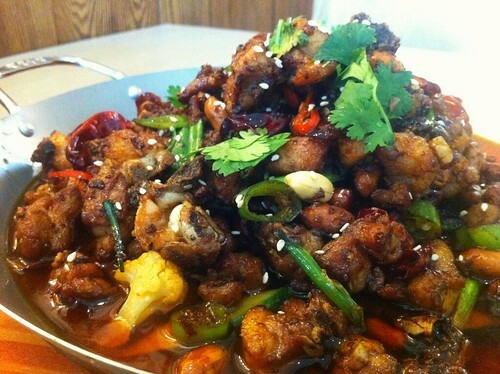 In addition to favourites like bang bang chicken and Chongqing chilli barbeques with pork or barramundi, there are pork chitterlings, spicy duck wings 'n feet, hot pots with lamb-you-name-it (slices, heart, tripe, liver, assorted other offal) and a dish that may require a little Dutch courage before ordering: hot blood curd combination pot. What they DIDN'T have on the menu which almost caused me to table-flip were my two favourite dishes from South Yarra, the fish-flavoured eggplant and the cumin lamb slices. My waiter, however, duly noted my dismay and promised they'll be adding more dishes to the menu as the kitchen settles in, as well as adding lunch specials (at the moment you can only order full dinner serves). 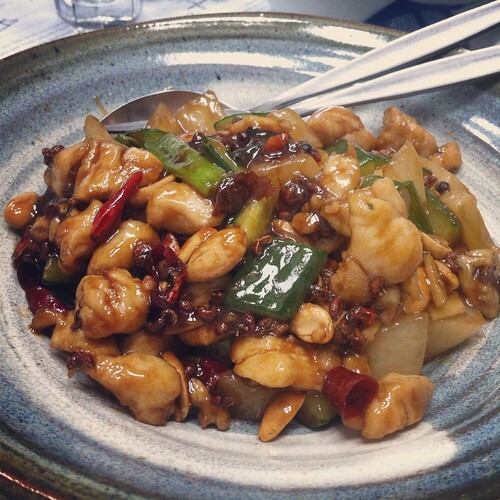 I decided to keep it simple today and order the Sichuan free range chicken wok ($28.80), and was rewarded with plenty of hallucinatory Sichuan peppercorns. I look forward to returning to test out the menu properly, once they've settled in. 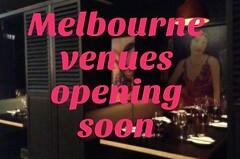 And the good news for those of you in the Eastern suburbs? 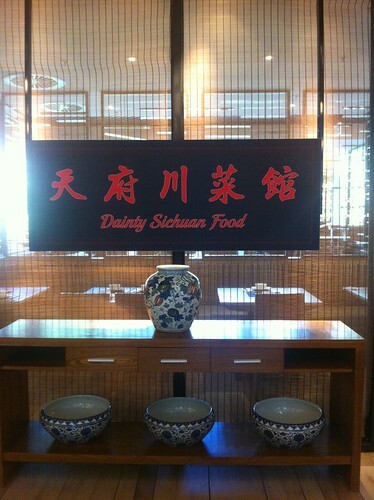 A third (hot-pot-centric) Dainty Sichuan will be opening shortly in Box Hill!